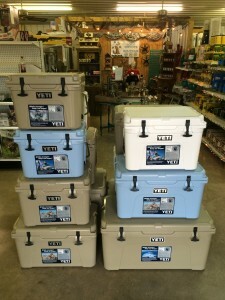 We are proud to announce that Eagle Hardware has become our regions distributor for the Yeti cooler line. 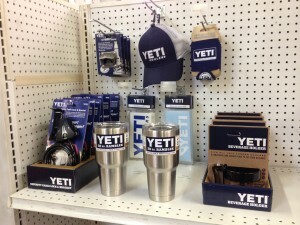 If you know anything about Yeti, enough said. If not be prepared to be impressed. These coolers are unlike any other you’ve ever seen. The ability to withstand anything almost seems an understatement. As customers have learned of our announcement and already own one, tell me of crazy stories of how durable they are. From falling out of the back of a truck to riding under a bouncing Jeep from West Texas, they last. But not only are they as durable as rock, they flat keep ice, ice! Just the other day Tim was in here and showed me what was in his. It was a Monday and he had but a bag of ice in on the previous Friday. When we opened the Yeti, the whole bag of ice was there. It immediately made a believer out of me. All that to say; they are what they are cracked up to be. We are thrilled to add them here and what better timing. What better gift to give the hunter, camper, horse lover and just about anybody. Stop by and let us show them off to you.